Klamath Falls, at 4100 feet elevation is the closest sizeable town to Crater Lake and sits on the southern shore of Upper Klamath Lake, the largest body of fresh water in the northwest covering 133 square miles. Originally named Linkville in 1867. the town was renamed Klamath Falls in 1893. Lake of the Woods Resort is just 24 miles from Klamath Falls, and provides a terrific getaway destination and base to explore the many year round outdoor recreational activities in the Klamath Falls area and the Southern Oregon Cascade Mountains. The natural high mountain lake covers 1,146 acres and is a popular destination for fishing, sailing, boating and a whole host of outdoor recreational activities.. Economically, lumber and agriculture, which drew most of the early settlers to the area, today share the scene with high tech manufacturing facilites. For recreation there is everything from hunting and fishing in the pristine beauty of its mountains, marshes, lakes and rivers, sight-seeing at the many attractions including the majestic Crater Lake, to the performing arts. Klamath County is home to Crater Lake National Park and sits directly under the Pacific Flyway. Millions of migrating birds rest and refuel in the county's six wildlife refuges, all within a 50-mile radius of Klamath Falls. The largest concentration of bald eagles in the lower 48 states winters in Klamath County. Each February, nature enthusiasts from around the world celebrate this phenomenon at the Bald Eagle Conference in Klamath Falls. The white Pelican is the county mascot and is a familiar sight on nearby lakes and rivers. Protected by law, this bird often has a wingspan of 10 feet. 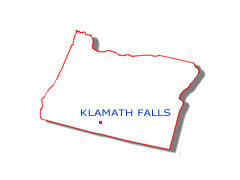 Today, Klamath County is best known for its wetlands, woodlands and wildlife. Within the Klamath basin are no less than six National Wildlife Refuges: Bear Valley, Clear Lake, Klamath Marsh, Lower Klamath, Tule Lake and Upper Klamath.